The Att’y. Gen. of the Distrito Federal (Mexico City’s metro area) said that so far this year there have been 128 reports of kidnappings in that area. The announcement was made in connection with the capture of a kidnapping gang who would cut a finger off from victims as a pressure tactic to enforce ransom demands. Mexico’s “PGR” (Dep’t. of Justice) reported that following the arrest in January of Alfredo Beltran Leyva, a higher up in the Sinaloa Cartel, officials found a roster of at least twenty Mex. military, both of officers and of enlisted ranks. These military were assigned to Sinaloa and also were on the payroll of the cartel for as much as 7 to 15 thousand dollars a week. Some of those military have already been jailed as a result of that finding. This information followed the finding of the same cartel’s infiltration into the “PGR” itself, and even higher weekly payments. Three members of two different musical groups and one other individual fell victim to an assault rifle attack in Culiacan as they chatted in the street following an interview at a local newspaper. Earlier in the day two other bodies were found in the neighboring Costerita area; both showed signs of having been tortured, had been shot elsewhere and then had been dumped right by a highway. 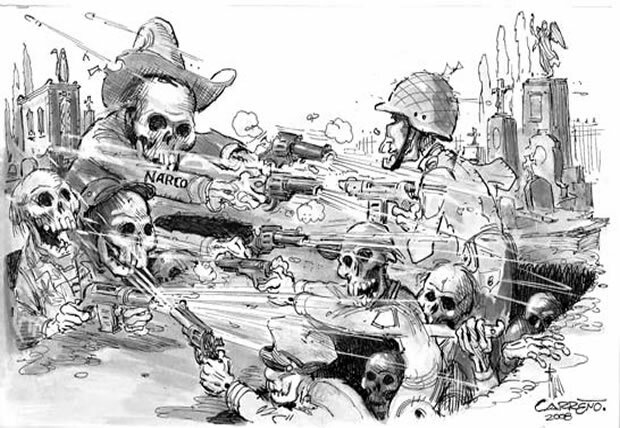 Organized crime made its presence felt in the state of Mexico; the result was twelve deaths, among them four State Security Agency officers murdered and four others wounded in six different towns. Another sixteen homicides, three forcible abductions and one kidnapping took place elsewhere in the country. (Note: as reported, forcible abductions – being carried off violently – occur when the victim is to be harmed. Kidnappings are for monetary ransom.) Thirteen of the homicides were in the state of Chihuahua and one each in Jalisco, Durango and Guerrero. Of the Chihuahua crimes, the standout was the case of a woman and a man who were placed against a wall in the Melchor Ocampo section of Juarez, then executed with “at least” 15 rifle shots and finished off with a coup de grace. And U.S. Border and Customs Protection officers at the Otay border crossing inspected a vehicle being driven into the U.S.; the result was the finding of forty kilos of cocaine. The driver, a Mexican citizen, was arrested. Mex. military discovered and destroyed twelve tons of marihuana in the Yolche community, Tulum municipality, Quintana Roo. Colombian Navy units on patrol on the Pacific located a small shrimp boat with 27 Chinese aboard. When detected, the two Colombian crewmen jumped into the sea but were rescued and arrested. All the Chinese are in Colombia illegally; they were taken to the port city of Buenaventura and turned over to officials of Colombia’s “DAS” (equiv. to FBI). The event took place off the far northern portion of Colombia’s Pacific coast.